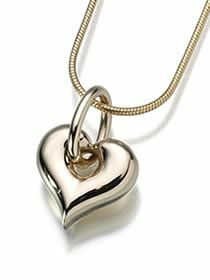 The gold vermeil puffed heart pendant pendant has a discreet chamber inside which can be used to hold a token amount of your loved ones ashes. The pendant is easily filled through the secure threaded opening using the included small funnel. The pendant measures 30mm x 19mm and comes complete with a velet presentation box. PLEASE NOTE A CHAIN IS NOT INCLUDED.